Having more and more texts available digitally enables us to create simple but effective study tools. While the value of traditional learning techniques and a great deal of practice must not be underestimated, some digital tools can reinforce such a learning style. As a student of theology at the Radboud Univeristy in Nijmegen, and later Hebrew and Aramaic studies at Leiden University, I created several tools to help students of Biblical Hebrew. They are all available as web applications at https://hebrewtools.org/, and their source is available at https://github.com/HebrewTools under open source licenses. I am grateful to the ETCBC for the opportunity to describe these and some other useful studying tools. 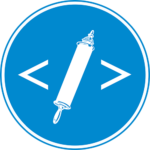 The first tool that will be useful to beginning students is the “Parse Trainer”. It is meant to train parsing verbal forms. The goal here is to quickly recognise forms (instead of having to mentally reiterate the verbal paradigm to arrive at the form to parse). In the sidebar of the tool you can select what kind of forms are given, so that you can filter out the forms you don’t know yet. The tool is somewhat similar of the Animated Hebrew flashcards (which unfortunately does not run on most modern systems). There is also a Memrise course of the regular verb, but it focuses on translation rather than morphological analysis, and does not recognise morphological overlap. When the Parse Trainer gives a form with multiple possible parsings, you are asked for all of them. The idea is that subordinate clauses are indented once and direct speech is indented a lot, three or more times. 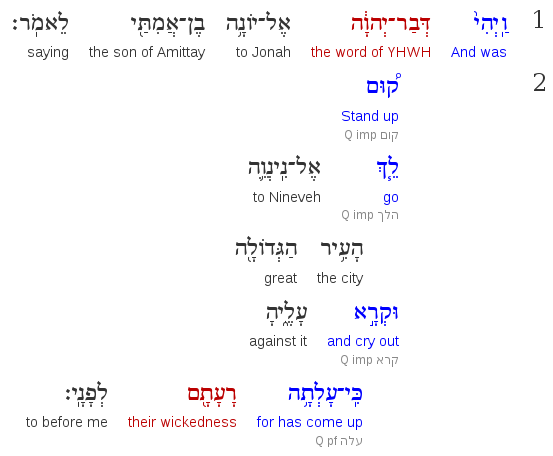 As the student progresses, minor relative clauses as ‘the great city’ in Jonah 1:2 need not be put on a separate line; the tool is meant to be flexible to layout a text however the user finds it useful. As you can see, you can add translations and notes about verbal forms to words. You can also colour words, the suggestion is to colour the predicate blue and the subject red. Formatting a text in this way should be possible without translating it precisely and greatly helps your understanding of the language. It also helps to break the text up in smaller chunks before translating it. While the interface can be a little daunting at first, it should be convenient once you get the hang of it. Click ‘help’ in the top right to learn about the keyboard shortcuts. The last tool I made is the “Reader Generator”. The student is now ready to read large portions of text as-is, and is most helped by simply reading a lot of source texts. However, it is not always convenient to take your Hebrew Bible and dictionary everywhere you go. The Reader Generator extracts a collection of biblical texts and generates a PDF of just those texts. It also adds a word list containing just those words found in the text. Thus you can easily take a couple of chapters with you for on the commute. One area in which I did not create any tools is that of vocabulary learning. That is because good solutions already exist. As for digital tools, I am particularly fond of the Top 1000 Words course on Memrise; another popular course is Basics of BH Vocabulary. I hope that the above is a useful overview of digital tools for the study of Biblical Hebrew. My own tools are neither perfect nor complete; ideas for improvements or entirely new tools are always welcome.